When facing a terminal illness the person who is ill, you as their carer and other members of the family may not know what they should do next or how to talk about their worries and fears. Caring for someone who is seriously ill may be rewarding but it is also extremely draining emotionally and physically. Just thinking about death creates strong emotions. The person you care for may be elderly and feel that they are wearing out and that life cannot go on much longer. They may have a number of debilitating but not fatal conditions and have undergone a lot of medical treatments; finally they have come to the conclusion that they are not long for this world. Perhaps however, the person you care for has been seriously ill and told that they are not going to recover. Whatever the situation, your thoughts will be turning in your mind and may be very mixed. While angry that your loved one is coming to the end of their lives and will no longer be there for you, you may also recognise that the quality of life that they are living is poor and that it would be kinder for them to die. The important thing is not to bottle up your feelings. If possible, talk to the loved one you care for. They too will almost certainly be extremely anxious. Even if they appear calm, they are approaching the great unknown and despite strong religious faith, may have understandable doubts about what will happen to them. Your loved one may tire very quickly and be distressed by their loss of independence. Despite your own emotional difficulties, you need to try and be supportive and understanding. As with all caring, try to share the responsibility with other family members and friends. A WILL is a simple exercise that makes sure that a person’s estate is distributed as they would wish after death. Most people choose to ask a solicitor to draw a will up although do-it-yourself wills are available for purchase from major stationers. Drawing up a will makes economic and practical sense to avoid unnecessary costs and heartache after someone’s death. A LIVING WILL is an advance statement about future medical treatment and care that someone chooses to have. For example it may state that treatment should be withdrawn under specific circumstances, or on the contrary, that the person wants every treatment possible to maintain their life. It is legally binding provided that at the time of signature, the person who has written it has the mental capacity to make the decisions contained in the Living Will; understands its consequences; makes clear their wishes as to future medical treatment; and finally, makes the decision(s) voluntarily. A Living Will should be witnessed, usually by a doctor. Unlike the Lasting Power of Attorney below, it can be as detailed and specific as the individual writing it wants. It does not hand over blanket responsibility to someone else. A LASTING POWER OF ATTORNEY gives another person responsibility for all financial and personal decisions if someone loses the ability to act for themselves. For example, if someone falls into a coma, the person named in the Lasting Power of Attorney, will make all medical decisions on their behalf as well as deal with any home or business matters. 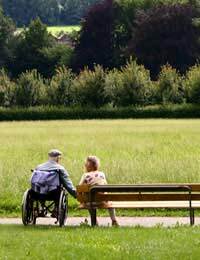 The Lasting Power of Attorney needs to registered with the Public Guardianship Office and forms can be obtained at: www.publicguardian.gov.uk. It cannot be over-estimated how important it is for someone who is dying to have dealt with these practicalities to save additional grief and rancour later. Death is the one thing that waits us all and emotionally, there is no right or wrong way to approach it either for the individual concerned or those who love them.